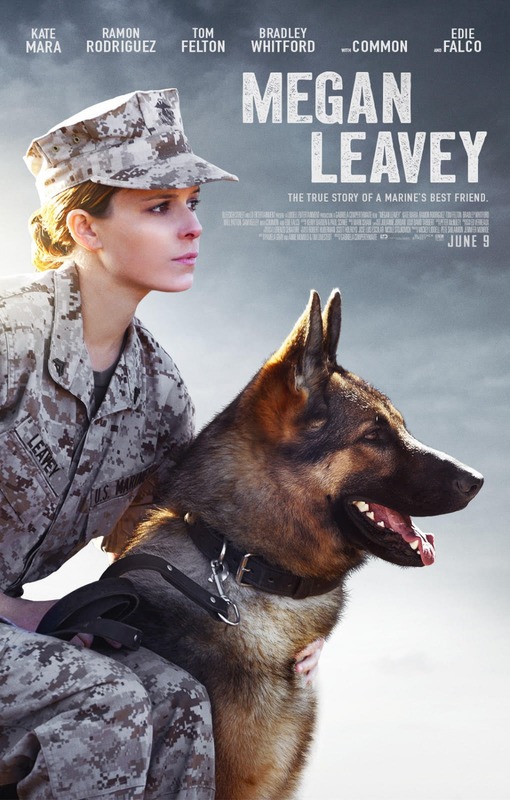 Based on the true life story of a young Marine Corporal (Kate Mara) whose unique discipline and bond with her military combat dog saved many lives during their deployment in Iraq. When she is assigned to clean up the K9 unit after a disciplinary hearing, Leavey identifies with a particularly aggressive dog, Rex, and is given the chance to train him. Over the course of their service, Megan and Rex completed more than 100 missions until an IED explosion injures them, putting their fate in jeopardy. Dedication: This film is dedicated to the many service men, women, & military working dogs who have sacrificed their lives defending our nation. Amy has a seemingly perfect life – a great marriage, over-achieving kids, beautiful home and a career. However she’s over-worked, over-committed and exhausted to the point that she’s about to snap. 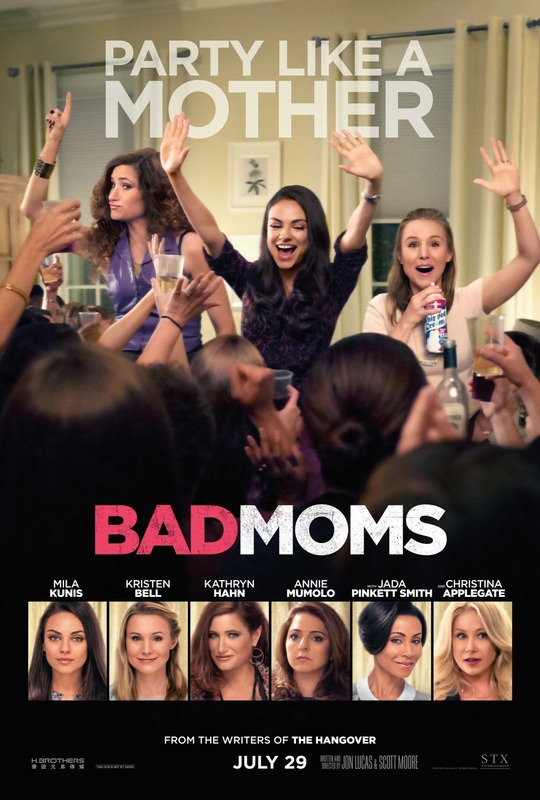 Fed up, she joins forces with two other over-stressed moms on a quest to liberate themselves from conventional responsibilities – going on a wild, un-mom-like binge of long overdue freedom, fun and self-indulgence – putting them on a collision course with PTA Queen Bee Gwendolyn and her clique of devoted perfect moms. Interviews are shown with the stars of the film alongside their mothers. David O. Russell is a very divisive filmmaker. For every person like me who considered American Hustle this brilliant, energetic experience, there was someone who found the movie sloppy, arrogant and generic. These people aren’t necessarily wrong but his latest movie Joy (seemingly his most polarizing movie to date) made me realize something. I love David O. Russell’s direction for a lot of the reasons people hate him. Joy isn’t as outstanding as Silver Linings Playbook or American Hustle, but it has David O. Russell doing everything he does best and he still delivers one hell of a movie. Joy is a clever and ambitious glimpse into a low income, single mother’s determination to follow her dreams and rise to the top in late 20th century America. Joy Mangano (Jennifer Lawrence) is a brilliant, imaginative young woman living a nightmarish life in New York in the late 1980’s. Her dreams of inventing things were put on hold for a variety of reasons. Her divorced mother (Virginia Madsen) and father (Robert De Niro) both live in her house and she constantly has to take care of them. Her marriage with a failed singer named Tony (Édgar Ramírez) led to two kids and a separation and now her ex-husband and there kids also live in this house. And I haven’t even mentioned her awful job at an airport where she isn’t respected by her boss or the customers. This endless chaos has seemingly put an end to the hopes she had when she was just a little girl. But a random accident and a bad dream leads to Joy creating an exciting new product called the Miracle Mop. Using only her smarts and her invention, she must battle a storm of issues including a psychotic step sister, a corrupt building company and Neil Walker (Bradley Cooper), the arrogant head of the QVC network which ends up making her product famous. One of the things I love about David O. Russell is how much liveliness there is to his storytelling. American Hustle is a movie where something is always happening and you have to be alert the entire time to learn more about the characters and follow the story. There’s an eccentricity and a confidence to it that you don’t see in a lot of writers these days. With Joy, he brings his form of storytelling to even louder and more intense levels. People might complain that its story is sloppy and noisy and unpleasant. To this criticism I have to say, well yeah…that’s the point. Joy is supposed to be drowning in her life. She has to deal with all of these problems and she never gets any moments of alone time or peace of mind. Jennifer Lawrence’s excellent performance gives us a woman with a confident exterior who is secretly dying inside. There’s a terrific moment when she’s fighting with Tony and there’s a split second where you can see her rise to level of horror and panic that she rarely shows. When she creates the Miracle Mop, she has even more issues to deal with and it’s only when she has successfully made sure that her product is safe that she can finally rest. Joy is a claustrophobic, chaotic experience because it’s meant to play as an escape story. But it’s not an escape story like Gravity where an astronaut must escape certain death in space, it’s about the escape of a single mother from the expectations and the limits society has put around her for her entire life. Her father puts down everything she does and her mother wastes her life away watching soap operas on her TV. Neil talks down to her and doesn’t respect the work she puts into the things she does. The movie traps you into this awful life she leads and you feel her desperation and the loud, unstoppable noise she has to live with. This makes you want to see her get out and break free and become her own person. The uneasiness you feel in her suburban life makes it’s that much more rewarding when you see her end up conquering her fears. That’s why the movie is quick and feels like all of these sub-plots are just about to fall in on each other. My favorite moment in the movie comes near the end of the story when it looks like Joy has finally broken through with The Miracle Mop. She walks down the sidewalk and comes across this small toy shop. She doesn’t go inside but she looks into it through a window. Inside she sees this model train set that seems to contain the ideal, perfect little neighborhood. She also notices that inside this toy store is a happy family with two loving parents and a young girl. She can’t reach out and touch these things because again, it’s blocked by a window. And then she stops looking into the toy story and she looks up and sees a machine on top of her that creates artificial snow. As she looks up, the snow from this machine reaches her face and she seems to be completely calm. It seems like such a random moment but I think it beautifully summarizes an important message in the film. Joy can’t have that perfect, ordinary life that’s in the window. She doesn’t have ordinary parents, an ordinary marriage or an ordinary neighborhood to live in. This lifestyle will always be out of reach for her. But yet, maybe what she has is even better. The comfort she has is from something that she made. Her peace of mind can come from the fact that she has done something with her life that has affected a lot of people and made her a very powerful person. In the end, Joy’s moment of clarity comes from the power of human ingenuity rather than the dependence of the perfect ordinary family inside the toy store. The anger, the frustration with her family will always be a problem for her but it doesn’t have to be something that bothers her and it doesn’t have to be something that she has to seek the approval of anymore. She can give her own children a different life that’s free from the hardships she herself faced. 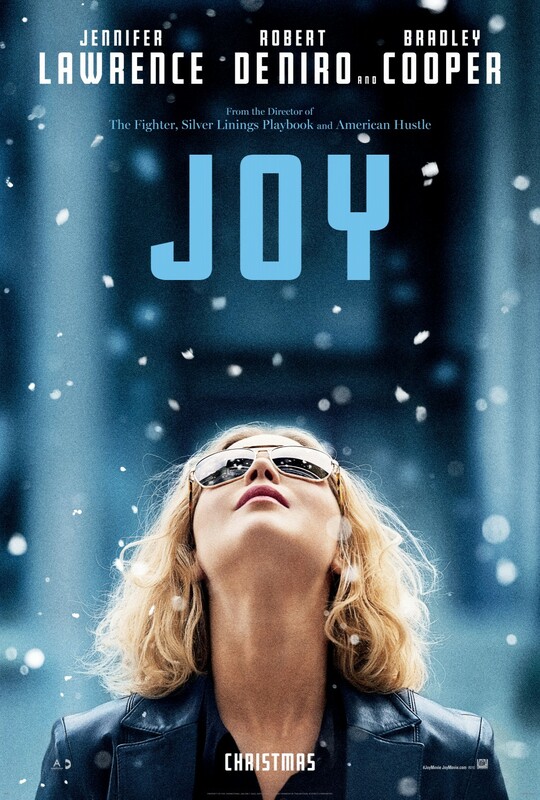 Joy is a movie about becoming something that no one ever believed in or supported besides you. All of the other lovely things you would expect from David O. Russell also make an appearance here. The movie has an amazing cast and Russell once again proves himself as perhaps being the best director working today when it comes to getting great performances out of his actors. As I already mentioned, Lawrence is wonderful as Joy and she gives her best performance here since Silver Linings Playbook. Robert De Niro, Edgar Ramirez and Bradley Cooper all make their characters very entertaining and memorable. Elisabeth Röhm is also playing a great villain in the few scenes she’s in as Joy’s manipulative step-sister who’s always resentful of what Joy has been able to accomplish. Other than Lawrence, I think the big stand out here would probably be Diane Ladd as Joy’s grandmother. Through thick and thin, she seems to be one of the few people who is always on Joy’s side and her narration in the film carries a lot of weight and significance. The production design and costume design do a great job of bringing you back to that time in the late 80’s to early 90’s, especially in the scenes that take place at the QVC network. The cinematography is beautiful and Russell brings to Joy the grainy, 70’s look that also made American Hustle look stunning and unique. The visuals in his films always remind me of what you would expect in an old Altman or Scorsese movie. And at this point, it seems unnecessary to point how excellent the soundtracks are in his films. There’s a moment in the movie where Joy faces a tragic event in her family and the song Expecting to Fly by Buffalo Springfield is used perfectly. David O. Russell is an extremely confident director and no matter what movie you watch from him, you know that you’re going to get this beautiful looking world that contains a distinct voice. When you watch one of his movies, you know that you will be getting something that looks like someone has put their blood, sweat and tears into it. That’s a surprising rarity with recent dramas like Spotlight that really could’ve been directed by anyone. More than American Hustle or Silver Linings Playbook, I can understand why people wouldn’t like this movie. The way the story is told is very bizarre and some of the characters could use a bit more development like her best friend/ex-husband Tony or Joy’s kids. But for all of its flaws and scratches, I unapologetically adored Joy. The film is incredibly made, excellently acted and it has one of the strongest character arcs of the year in its title character. The movie celebrates a woman who escapes from the certainty and the ugliness of her life to find a bright future in her own dreams and ideas. The cuts and the frantic nature of this world is what makes it human and David O. Russell has a clear talent for making situations and characters that feel alive and kicking. When we get to the last scene of Joy walking down the street with her shades on with seemingly endless confidence on her face, it makes you want to burst from your seat in well…joy.